Serena Williams breezed to her third Rogers Cup title with a 6-2, 6-0 victory over unseeded Romanian Sorana Cirstea in Sunday's final. Serena Williams insists it's not as easy as it looks. 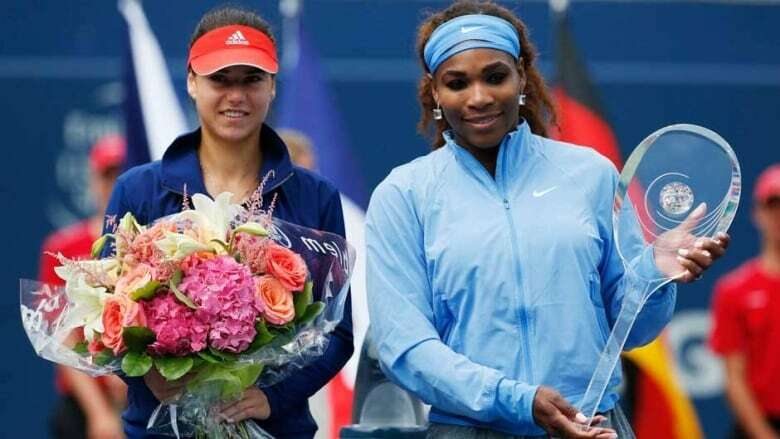 The top-seeded American breezed to her third Rogers Cup title with a 6-2, 6-0 victory over unseeded Romanian Sorana Cirstea in Sunday's final in Toronto, giving Williams her eighth WTA title of the year and 54th of her career. She didn't drop a set all week at the $2.369-million US tournament and lost only 22 games, almost half of which came against third-seed Agnieszka Radwanska in a semifinal match which proved to be the only real test for the world No. 1 in Toronto. With the absence of top-five players Maria Sharapova and Victoria Azarenka, and the early exit of Wimbledon champ Marion Bartoli, all due to injury, Williams's path to the title was made considerably less obstructed. Even though the Canadian men were making history in front of roaring crowds in Montreal, attendance dipped at both the men's and women's Rogers Cup tournaments. Women's tournament director Karl Hale addressed the media prior to top-ranked American Serena Williams winning her third Rogers Cup title with a straight sets victory over unseeded Romanian Sorana Cirstea in Sunday's final. Although the audience at Rexall Centre for the final was mostly full and somewhat raucous, thanks to a large contingent of Romanian supporters, the scene was not the norm during the week-long tournament. This year the upper stands, erected above the top-level of the stadium to add seating, were removed to create a more "intimate experience" for fans, according to tournament officials. However, it was not unusual to see swaths of empty seats during centre court matches, including the quarter-finals and semifinals. "We expect [attendance] to be down based on the fact that the upper stands aren't there," said Hale. "We knew that going in to make this experience more intimate, which I think everyone can agree has been very successful, so we knew that we were going to take a hit to go forward with our event." Contributing perhaps to the decline in ticket sales was the loss of star power at the event. World No. 2 and No. 3-ranked players Maria Sharapova and Victoria Azarenka, respectively, both pulled out with injuries prior to the tournament. That left Williams to carry most of the load, in terms of marquee status. "Well, we lost Maria Sharapova and Victoria Azarenka. We would have liked to have had them," said Hale. "It definitely impacts our sales, but considering during the week Serena did a fantastic job, all of her matches were well attended and she's a fan favourite, so we're very happy to have her." An early exit from rising Canadian star Eugenie Bouchard — her image hanging on banners across the stadium — in the second round didn't help matters. Surprisingly, attendance was down by more than 13,000 in Montreal, although it would be tough to beat the 213,760 that turned out the last time the men played there in 2011. That was a world record for a one-week tournament. There were 200,394 this year, which was more like the 2009 attendance of 200,077. But with expectation comes pressure, and Williams proved more than up to the task. "No tournament is ever easy, especially being in the position I am in," said Williams. "The tournament starts and they expect you to win. And the tournament is like, 'you're going to be in the final and after your semifinal I want you to do this, and you have to do this and this press.' Who knows if I'll even make it to the semifinals? "It's a lot of pressure. It's not easy." Williams says she likes where her game it as heading towards the U.S Open, where she is the defending champion, and she'll look to use this victory as momentum this week in Cincinnati. Despite only having lost one match since March, a stunning early exit at Wimbledon, Williams says there's still room for improvement. "For me it's always about constantly improving and never saying 'I did great and I can be satisfied,"' she said. "I did great [today], but what can I do better? What can I improve on? That's what I always strive for. "When I get satisfied, and for a lot of players, the [playing] level goes down." Cirstea, meanwhile, had a breakthrough tournament, having ousted two former world No. 1s in Jelena Jankovic and Caroline Wozniacki before dethroning defending champion Petra Kvitova in the quarters, then fourth-seed Li Na of China in the semifinals. She was appearing in only her third WTA final and looking to build on her only title, won way back in 2008 at Tashkent. "For me it's been a really positive week and I'm going to take everything that well to the next tournament," said Cirstea. Cirstea showed her nerves from the opening game, double faulting the first point and again at 30-40 to give Williams an early break. Williams broke again for 3-0 after Cirstea sent a backhand wide. That prompted a visit from her Australian coach Darren Cahill, who gave the 23-year-old a pep talk. It appeared to work momentarily as Cirstea won four straight points to break back and held serve at 3-2 to get back in the match. But Williams quickly removed any chance of an upset, winning two straight games and acing a set point winner for 6-2. "The start was not as bad as the scored showed," said Cirstea. "The first three games I had really good chances so I could have been up three-love. Suddenly I found myself down three-love. I know the score seems quite tough but there were moments when I felt the match was closer than it seemed." With shouts of "Sorana" and "Serena" volleying back and forth around the stadium like tennis balls, splashes of Romania's blue, yellow and red could be seen dotting the almost-full Rexall Centre stands on a warm, sunny afternoon. "I was surprised to see how many Romanians there were out there and how many flags I've seen," said Cirstea. "It was an incredible atmosphere and it made me feel like home when they were screaming, supporting me and saying positive things. I'm looking forward to coming back here." The vocal contingent cheering on Cirstea didn't have much to go on in the second set. Williams broke out of the gate using her trademark power strokes to keep Cirstea running and ripped a 199 km/h ace to hold serve at 2-0. Cirstea, with her head hanging low, again called over Cahill for motivation, but it did little this time as Williams eased through the final four games and wrapped up the match in just over an hour. Williams gets $426,000 for the win while Cirstea will take home $213,000 — almost half her prize money earned so far this year. Cirstea teared up during the trophy presentation and graciously expressed her admiration for Williams. "Usually I'm quite emotional," said the Romanian. "Of course I was disapointed because I wanted to play better, so it's mixed feelings out there. I think even if I won today I would still be crying." All three of Williams's Rogers Cup titles have come in Toronto, the first in 2001 before winning it again in 2011. She says she loves playing in this city because of the friends who come out to see her play. Local hip-hop star Drake, who was also present for her 2011 win, sat courtside and cheered on Williams. "We're really good friends," said Williams, "I was excited that he made it today." In the doubles final, Jankovic and Katarina Srebotnik of Slovenia won 5-7, 6-2, 10-6 over Anna-Lena Groenefeld of Germany and Czech Kveta Peschke.